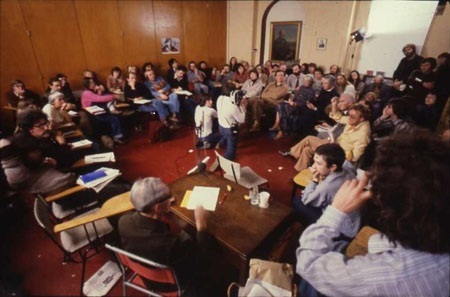 History Workshop 13, on the subject of People’s History and Socialist Theory, took place between 30 November and 2 December 1979 at Ruskin College. 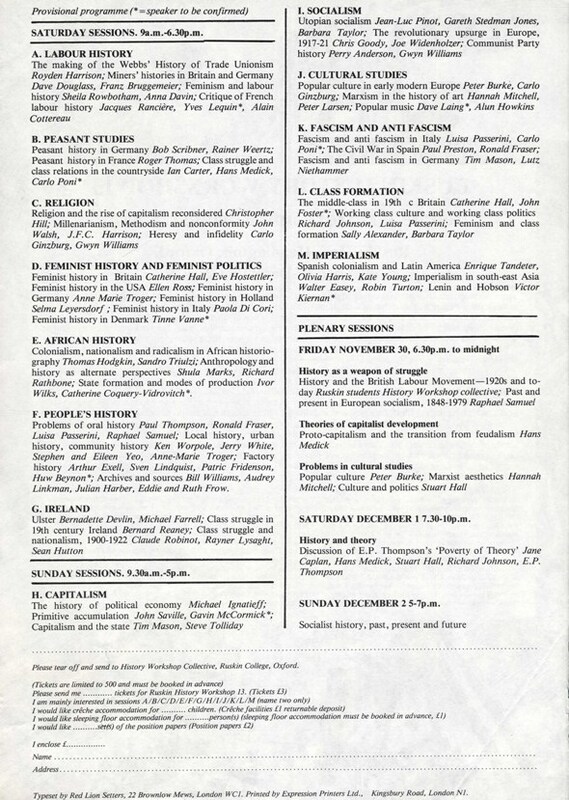 The centrepiece was a plenary session in which E. P. Thompson, Stuart Hall, Richard Johnson, and others debated points raised in Thompson’s book The Poverty of Theory. 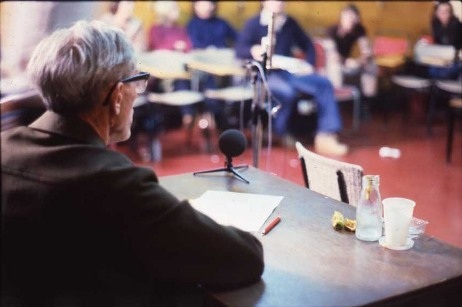 In a heated debate, Thompson faced criticism for the perceived use of overly personalised polemic in his counterblast to those influenced by the ‘Structural’ Marxism of Louis Althusser. Aside from plenary sessions, a number of parallel discussion sessions took place, organised around thirteen different themes of study. These included ‘Labour History’, ‘Peasant Studies’, ‘Religion’, ‘Feminist History and Feminist Politics’, ‘African History’, ‘People’s History’, ‘Ireland’, ‘Capitalism’, ‘Socialism’, ‘Cultural Studies’, ‘Fascism and Anti-Fascism’, ‘Class Formation’, and ‘Imperialism’. Among the papers given were Heresy and Infidelity, Feminist History in Denmark, Problems of Oral History, and Marxism in the History of Art. During History Workshop 13, some tensions within the movement broke into the open, leading the Workshop to move around the country for History Workshop 14 (held in Brighton) onwards. In particular, the heavily theoretical mode of some of the discussions was considered by some to be against the original spirit of the Workshop. It was felt that such discussion could become exclusive of the members of the Workshop movement who were not academics. Part 2: Peter Burke speaks at History Workshop 13 of the need for total history rather than socialist or social history. Part 3: Stuart Hall, speaking in a plenary session at History Workshop 13, criticises the ‘theoretical terrorism’ of those attacked by E. P. Thompson in the Poverty of Theory and accuses them of ‘stumbling forward from correctness to correctness’. Part 4: E. P. Thompson speaks in a plenary session at History Workshop 13: ‘The past is not dead’. He dismisses conceptions of history as a practice of regulation and insists on the applicability of theory to the real world. Part 5: Stuart Hall concludes debate in a plenary session at History Workshop 13 by insisting on the dangers of polemic as a mode of academic discussion. Part 6: A speaker in the Feminist History and Feminist Politics session outlines a revisionist analysis of the Factory Acts as a victory for patriarchy. Can you help us identify the speaker in this audio clip? Please leave a comment below if you can help! Part 7: Paola Di Cori speaks at History Workshop 13 about Women’s Studies in Italy. Part 8: Paul Thompson, speaking at History Workshop 13, outlines the view that all history has a social purpose. Part 9: Paul Thompson speaks at History Workshop 13 about oral history as the creation of a new kind of hero. The greatly increased size and organisational complexity of History Workshop also strained resources and tolerance at Ruskin, and particularly among the Ruskin students organising the Workshop and acting as stewards, beyond breaking point. The Workshop returned to Ruskin only once more in the course of the remaining fifteen events, for Workshop 25, held in 1991.